HONG KONG (Reuters) - Fast-food chain operator Yum China Holdings Inc (YUMC.N) has rejected a $17.6 billion(13.67 billion pounds) buyout offer from a consortium led by Chinese investment firm Hillhouse Capital Group, quashing what would have been one of Asia's biggest deals this year, people with direct knowledge of the matter said. The Hillhouse-led consortium, which included regional investment house Baring Private Equity Asia, expressed an interest to offer $46 per share, or nearly 24 percent above Tuesday's closing price, for the biggest fast-food chain in China, the people said. Global investment house KKR & Co (KKR.N) and Chinese sovereign wealth fund China Investment Corp were also part of the consortium, one of the people added. The consortium is not expected to take any immediate action and could just back off from pursuing the bid, that person said. Hillhouse had been tapping lenders to finance the deal, Reuters reported earlier this month, citing sources. Yum China was spun off from Yum Brands! Inc (YUM.N) in 2016 and listed on the New York Stock Exchange. It is the exclusive licensee of the KFC, Pizza Hut and Taco Bell brands in China with over 8,100 restaurants in more than 1,200 cities. The offer did not include detailed terms or the structure of the investor consortium, and the board decided it provided no extra value or strategy for the business, said one of the people, who requested anonymity as the information is confidential. The $46 per share offer values Yum China at 13 times its earnings before interest, taxes, depreciation, and amortization (EBITDA), slightly higher than McDonald's Corp multiple of (MCD.N) 12.6 but lower than Domino's Pizza Inc's (DPZ.N) 20.8 times. Yum China did not ask for a higher offer in its letter of rejection, two of the people said. Yum China said it would not comment on rumours or market speculation, but a representative said the company had potential to grow to 20,000 stores over the long term. Baring declined to comment. Hillhouse, KKR and CIC did not respond to requests for comment. 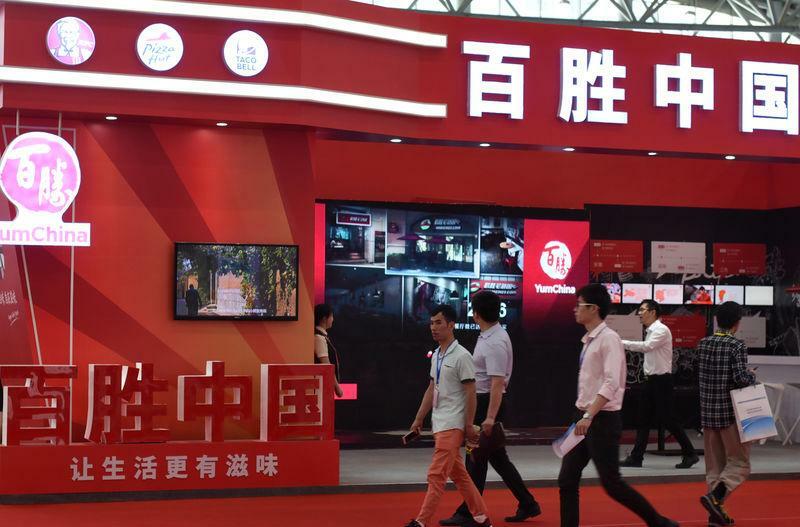 Chinese investment firm Primavera Capital and Ant Financial Services Group bought a minority stake in Yum China for $460 million as part of the spin-off deal in September 2016. Both are still shareholders in the company. Fred Hu, chairman of Primavera who is also the independent chairman of the Yum China board, did not immediately respond to a request for comment. Primavera got two Yum China board seats after the spin-off. The Wall Street Journal first reported the rejection, citing an unidentified person familiar with the matter. Shares of Yum China rose as much as 12 percent on Tuesday before closing 3.86 percent higher. In addition to KFC, Pizza Hut and Taco Bell brands, Yum China also runs Chinese fast-food chain First East Dawning and hotpot restaurant Little Sheep, which it acquired in 2012. Yum was the first major Western fast-food company to enter China, opening a KFC store in central Beijing in 1987. Parent Yum Brands! currently collects 3 percent of KFC, Taco Bell and Pizza Hut China sales as royalties. Former Yum China chairman and CEO Sam Su, who was pivotal in the company's expansion in the world's second-largest economy, now serves as an operating partner at Hillhouse, although one of the people said he was not involved in the proposed buyout. The company's second-quarter net income increased 13 percent year-on-year but Pizza Hut continued to face challenges in China's competitive casual dining space, its CEO said on Aug. 1.